Hi foodies...Welcome to AYESHA'S KITCHEN. 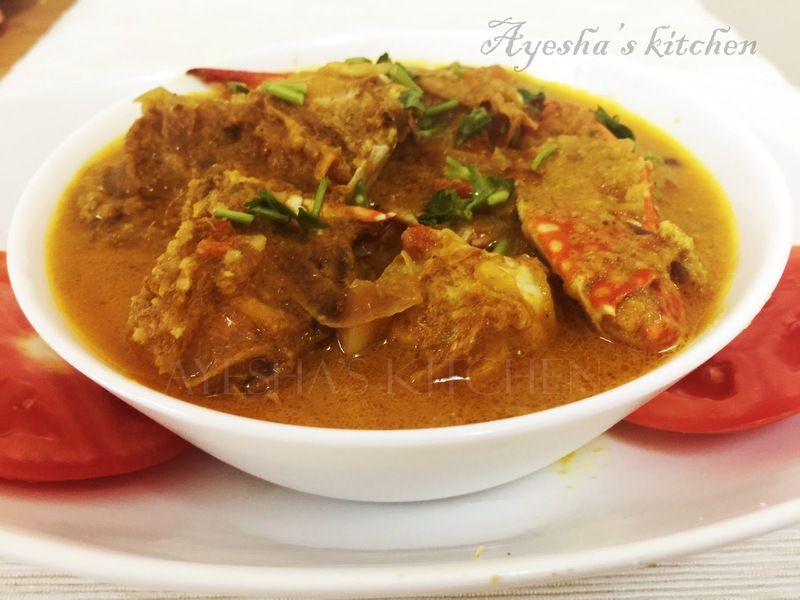 Here is the recipe for a perfect curry based crab dish which can be served along with rice, chappathi, paratha, dosa etc. Whenever I get fresh crabs, I prefer making this crab curry as it is so simple and delicious. Here marinated crab is shallow fried and then cooked in the coconut gravy which gives an aromatic flavor to this dish. Heat 2 tbsp of oil in a pan and fry the marinated crab until done and keep it aside. Now heat oil in a deep bottomed pot (preferably clay pot) and when hot add chopped ginger garlic. Then add small onion slices. Saute till done and then sliced tomatoes and green chilly. Put required salt and cook well with the lid closed. Now add the fried crab to it and cook for 2 minutes. Grind together coconut, fennel seed, (turmeric, coriander and chilly )powders in half cup of water. Grind to a fine paste. Pour this mixture into the crab roast masala and check for salt. Mix well and cook for few minutes on a medium flame. Stir occasionally. In a separate pan, heat 2 tbsp of oil and add 1 tsp sliced small onion.Saute well. Pour this over the curry and garnish with curry leaves.